A very interesting piece in the New York Times which in simple graphical form shows what I call the “subsidization economy”. Core activity is putrid but the morphine provided by federal government is immense. Put another way these are the forces of deflation versus inflation playing out. Deflationary forces are swirling to the point that all debt actually fell for the first time since 1954 despite government’s best efforts to unleash miles of federal government / central bank fire hoses of borrowing/spending. Stare at the bottom half of this graphic for a good few minutes…. THE United States government is borrowing money like never before. The national debt rose by more than a third over a one-year period, far more than it ever did at any time since World War II. In the past, when the government became a heavy borrower, there was talk about crowding out private borrowers. But this time, interest rates have remained low and no one seems to be worried about that. The reason is simple: Rather than crowding out the private sector, Uncle Sam is now standing in for it. Much of the government borrowing went to investments in financial institutions needed to keep them alive. Other hundreds of billions went to a variety of programs aimed at stimulating the private economy, including programs that effectively had the government pick up part of the cost for some home buyers and some auto buyers. This week, the Federal Reserve published its quarterly report on debt levels in the economy. While Uncle Sam borrowed more, others borrowed less. 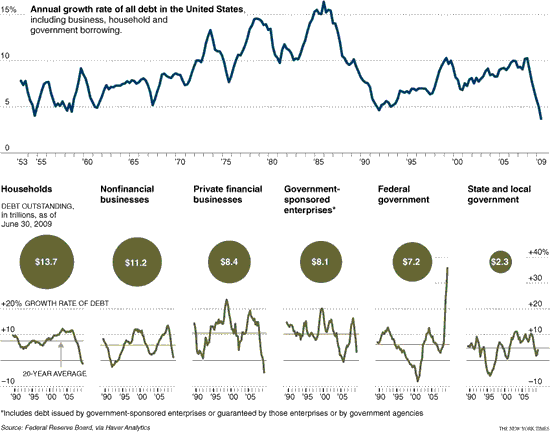 The accompanying chart shows that total domestic debt — the amounts owed by individuals, governments and businesses — climbed just 3.7 percent from the second quarter of 2008 through the second quarter of this year. That is the smallest increase since the Fed started these calculations in the early 1950s. Moreover, domestic debt declined in the second quarter, falling 0.3 percent to $50.8 trillion. The figures are not seasonally adjusted, making quarter-to-quarter comparisons risky, but it was the first such decline since the first quarter of 1954, when total debt was less than $500 billion. Here is a great point and why the US economy is in much more dire straits than people recognize. We’ve have not borrowed to create productive capacity – we’ve borrowerd to create financial hocus pocus so a tiny sliver of society could gather great wealth. I’m sorry… I mean financial innovation happened and it was great for all of us. For most of the last two decades, the biggest increase in debt in America came from financial companies. Much of that debt came from financial innovation rather than actual economic activity. Of course you will hear from those who benefit from the Federal Reserve largess, that they created lots of economic value. For themselves at least. Speaking of beat…. the beat goes on – we’ve only refinforced this game, made the big boys even bigger and let them know they can do whatever they wish because now they REALLY are integral to the system, and the powers that be in D.C. have told the nation they will not be allowed to fail. You can imagine the fallout this will cause in the coming 5-10 years. And when the next disaster happens – you will see the same policy responses. Because it is much better to repeat history than learn from it; especially when those benefiting from the system (and pulling the strings) could care less about the masses in the country, or long term health of the republic. It’s their ballgame – don’t complain, but please do send in your taxes as a good peasantry. Twenty years ago, nonfinancial businesses in the United States borrowed $1.70 for every dollar borrowed by the financial sector, government-guaranteed or not. Now the figure is 68 cents. Who needs non financial business? Americans? Not so much. We have financial hocus pocus – aka prosperity. How Does a Women’s Best Friend Compare as an Asset Class?